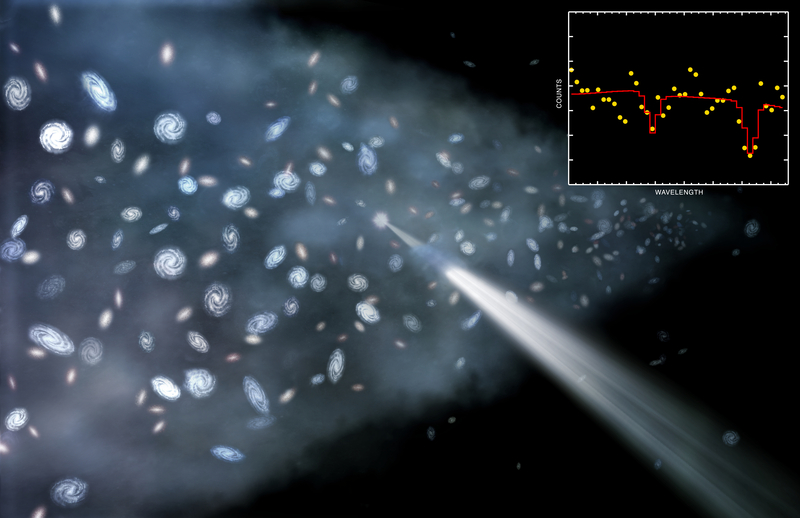 Scientists using two X-ray telescopes (Chandra and XMM-Newton) have found evidence for the "missing matter" in the nearby Universe. This matter is made up of hot diffuse gas, which is known as WHIM (warm-hot intergalactic medium). To get this result, researchers analyzed X-ray light from a distant quasar that passed through a "wall" of galaxies about 400 million light years from Earth. Scientists have used NASA's Chandra X-ray Observatory and ESA's XMM-Newton to detect a vast reservoir of gas lying along a wall-shaped structure of galaxies about 400 million light years from Earth. In this artist's impression, a close-up view of the so-called Sculptor Wall is depicted. Spiral and elliptical galaxies are shown in the wall along with the newly detected intergalactic gas, part of the so-called Warm Hot Intergalactic Medium (WHIM), shown in blue. This discovery is the strongest evidence yet that the "missing matter" in the nearby Universe is located in an enormous web of hot, diffuse gas. The X-ray emission from WHIM in this wall is too faint to be detected, so instead a search was made for absorption of light from a bright background source by the WHIM, using deep observations with Chandra and XMM. This background source is a rapidly growing supermassive black hole located far beyond the wall at a distance of about two billion light years. This is shown in the illustration as a star-like source, with light traveling through the Sculptor Wall towards the Earth. 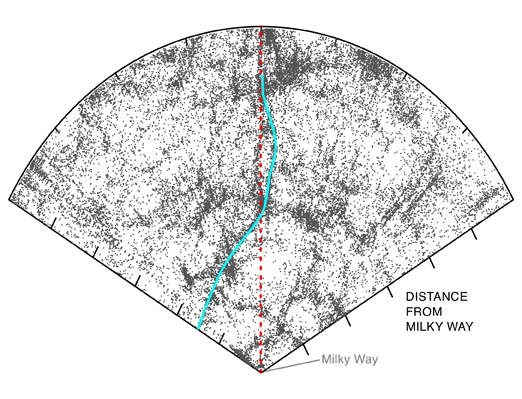 The relative location of the background source, the Sculptor Wall, and the Milky Way galaxy are shown in a separate plot, where the view instead looks down on the source and the Wall from above. An X-ray spectrum of the background source is given in the inset, where the yellow points show the Chandra data and the red line shows the best model for the spectrum after including all of the Chandra and XMM data. The dip in X-rays towards the right side of the spectrum corresponds to absorption by oxygen atoms in the WHIM contained in the Sculptor Wall. The characteristics of the absorption are consistent with the distance of the Sculptor Wall as well as the predicted temperature and density of the WHIM. This result gives scientists confidence that the WHIM will also be found in other large-scale structures. This result supports predictions that about half of the normal matter in the local Universe is found in a web of hot, diffuse gas composed of the WHIM. Normal matter — which is different from dark matter -- is composed of the particles, such as protons and neutrons, that are found on the Earth, in stars, gas, and so on. A variety of measurements have provided a good estimate of the amount of this "normal matter" present when the Universe was only a few billion years old. However, an inventory of the nearby Universe has turned up only about half as much normal matter, an embarrassingly large shortfall. Credit Illustration: NASA/CXC/M.Weiss; Spectrum: NASA/CXC/Univ. of California Irvine/T. Fang et al. Coordinates (J2000) RA 23h 59m 07.9s | Dec -30° 37´ 41.00"
References Fang, T., et al. 2010, ApJ 714, 1715.